A staff nurse greets some new arrivals at the Queen Charlotte Hospital in London, 1945. After the end of World War II, birth rates in the United States and other Western countries abnormally jumped up in a phenomenon that came to be called the baby boom. Technically, baby boomers are those people born worldwide between 1946 and 1964, the time frame most commonly used to define them. There are about 76 million boomers in the U.S., representing about 29 percent of the population. In Canada, they are known as “Boomies”; six million reside there. In Britain, the boomer generation is known as “the bulge”. 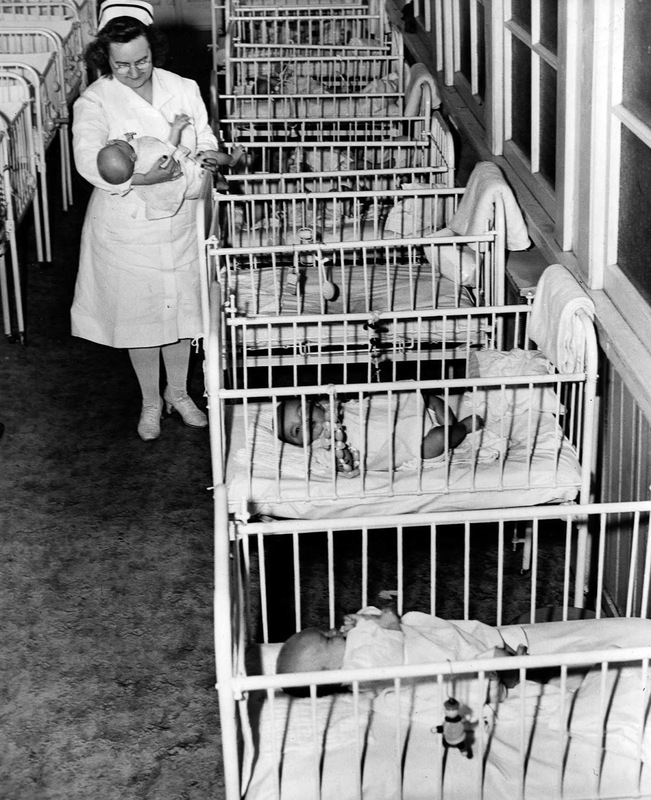 From 1944 to 1961, more than 65 million children were born in the United States. At the height of this baby boom, a child was born every seven seconds. Factors that contributed to the baby boom consisted of young couples who started families after putting off marriage during the War, government encouragement of growth of families through the aid of GI benefits, and popular culture that celebrated pregnancy, parenthood, and large families. 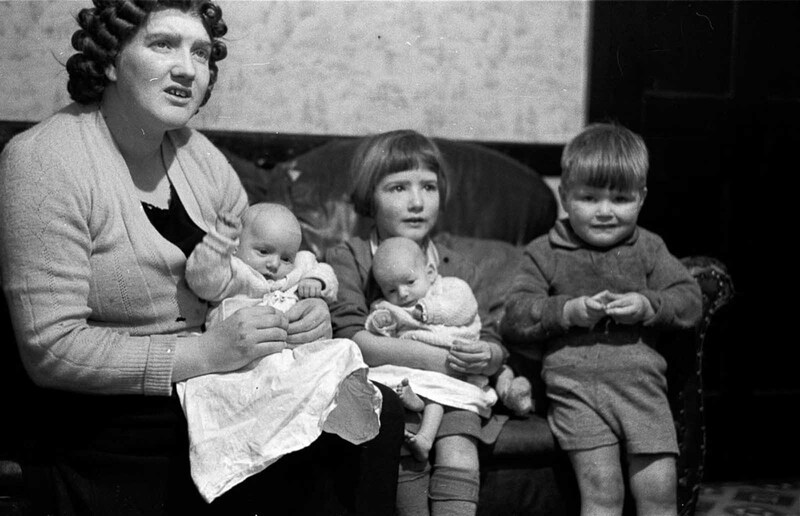 The baby boom was the result of couples holding off on having children due to the Great Depression and World War II. Once the baby boom began, the average woman started getting married around the age of 20 instead of 22. Couples were eager to have babies after the war ended because they knew that the world would be a safer place to start a family. The sheer size of the baby-boom generation in the U.S. magnified its impact on society: the growth of families led to a migration from cities to suburbs in the postwar years, prompting a building boom in housing, schools, and shopping malls. As the “boomers” reached young adulthood in the 1960s and ’70s, their tastes in music and their hair and dress styles strongly influenced the national culture, and the political activism of some contributed to the unpopularity of the Vietnam War. As they aged and prospered in the 1980s and ’90s, their buying habits determined the course of many consumer industries, including automobiles. Today, members of the baby boomer generation are just beginning to leave the labor force and enter retirement. 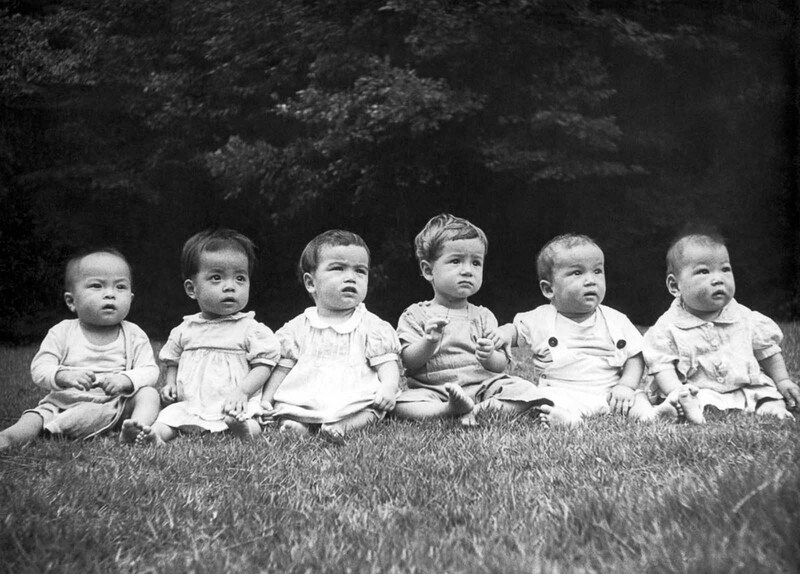 Infants and toddlers in an orphanage in post-war Japan, 1948. 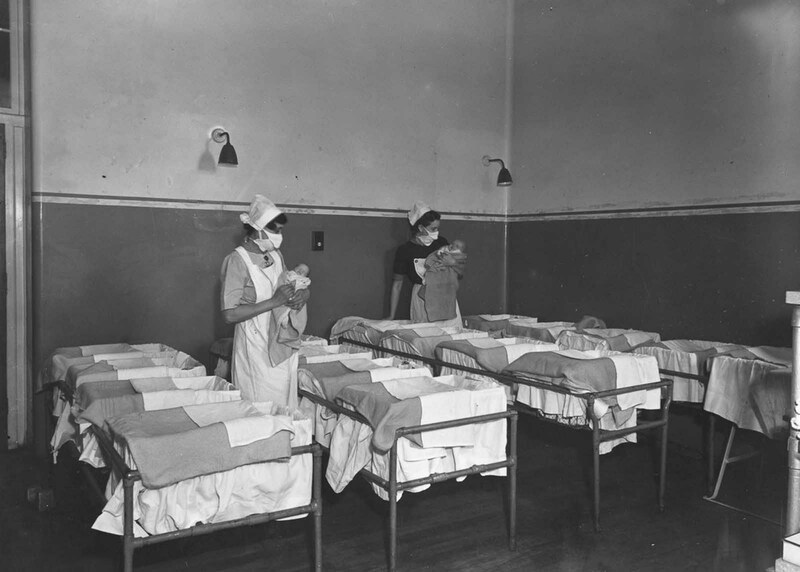 Nurses hold babies in a maternity ward at Guy’s Hospital, London, 1947. 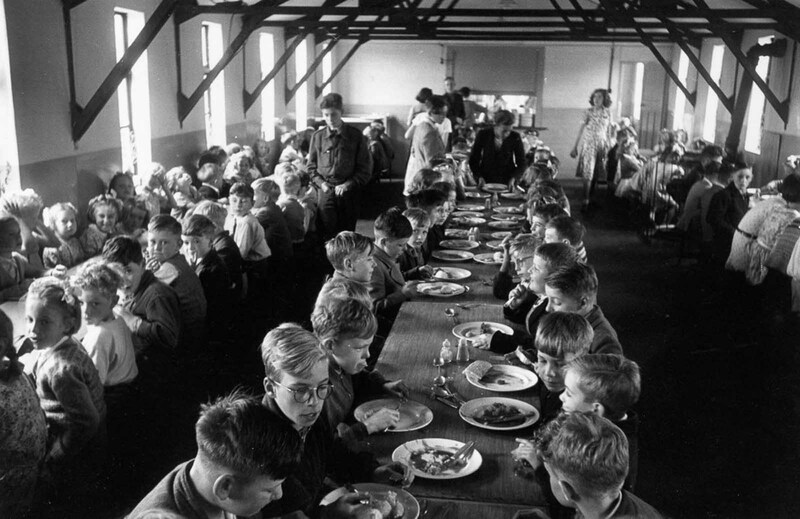 An overcrowded dining hall at Walsgrave Colliery School near Coventry, England filled by children of the post war baby boom, 1952. 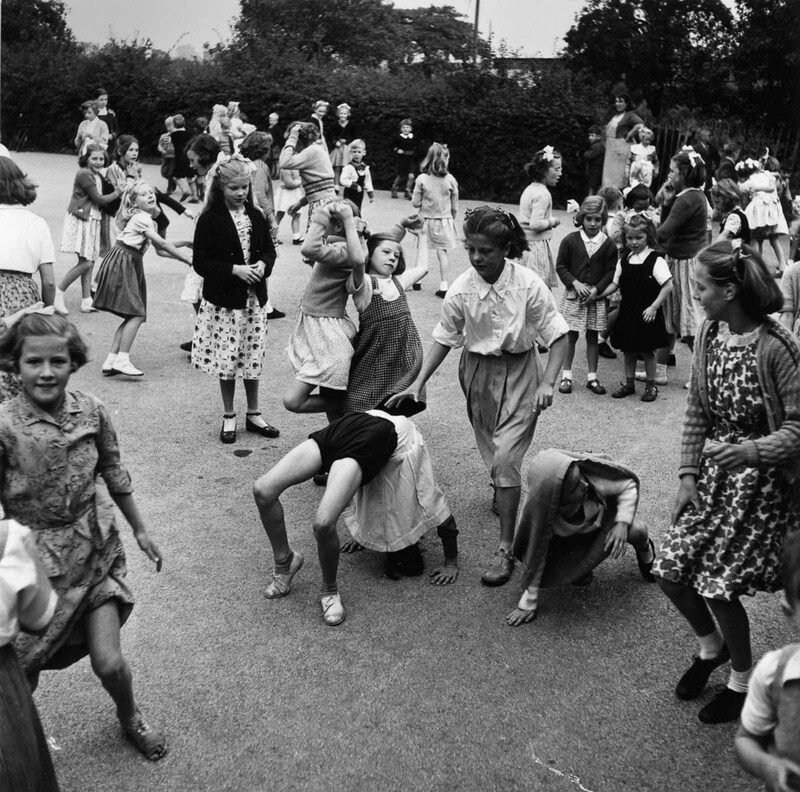 A crowd of schoolchildren in the playground of Walsgrave Colliery School near Coventry, England, 1952. 27-year-old Briton Ivy Bourne, mother of triplets and twins. 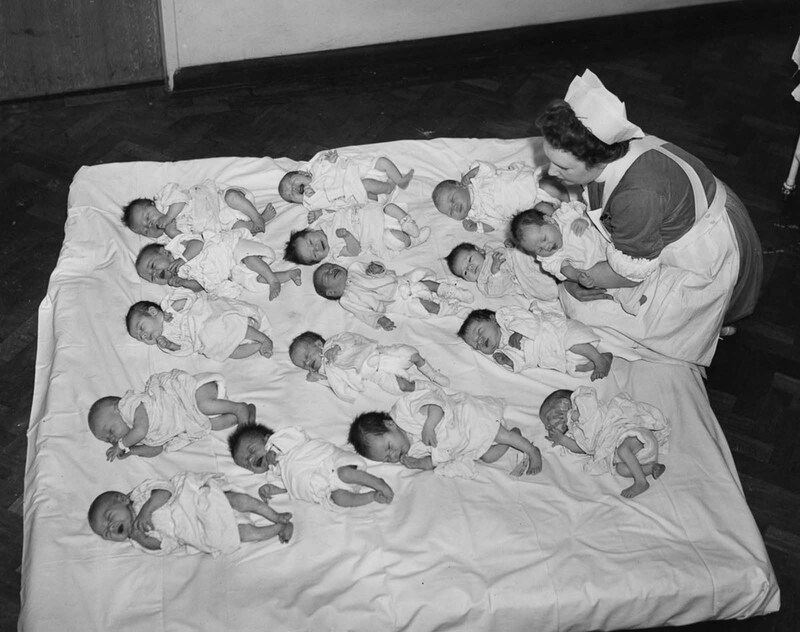 Her mother had a total of 22 children, including one set of triplets and four sets of twins, 1953. 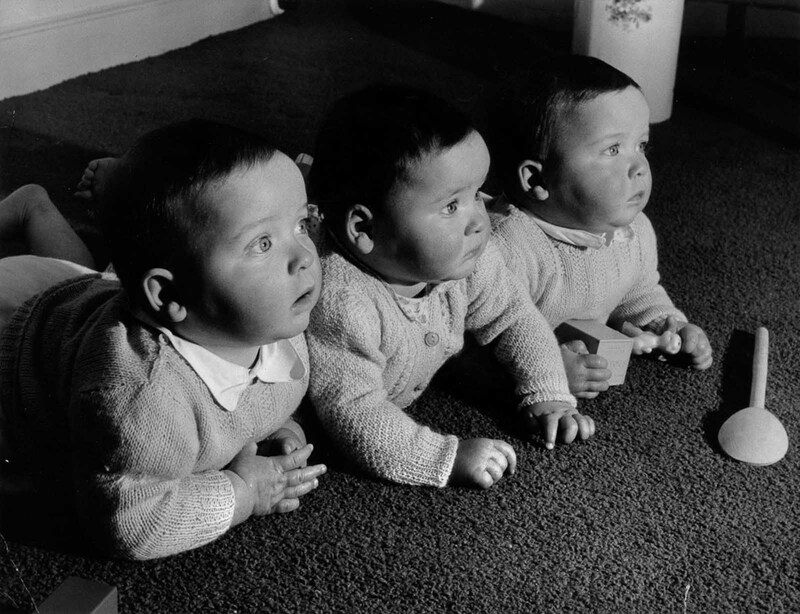 The Finslater triplets at home, 1955. 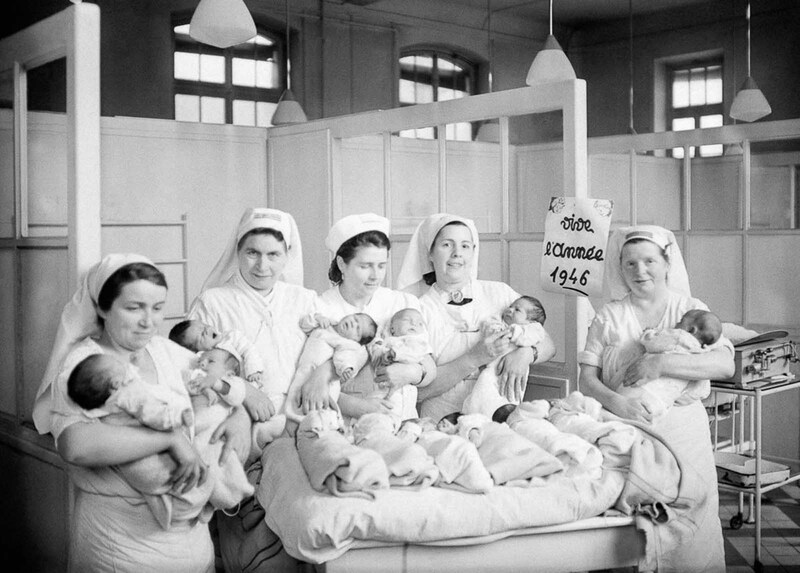 Nurses with newborns at a hospital in Paris, 1946. 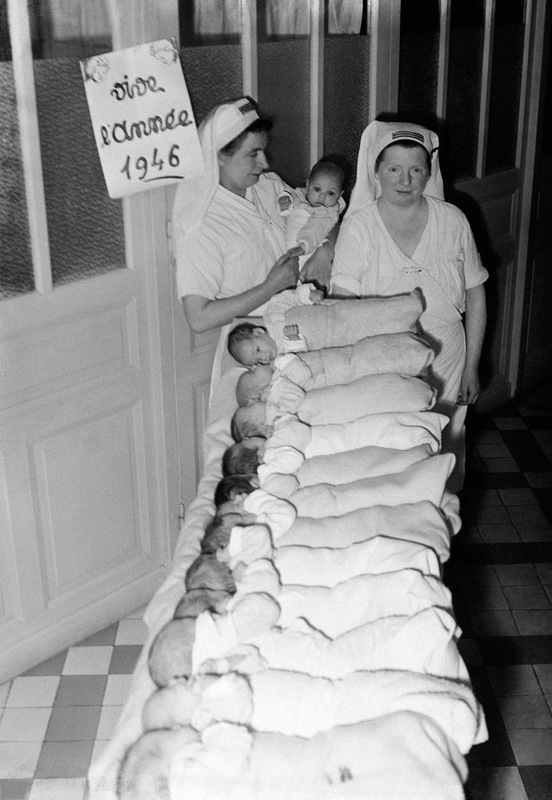 The first babies of the new year in a maternity ward in Paris, 1946. 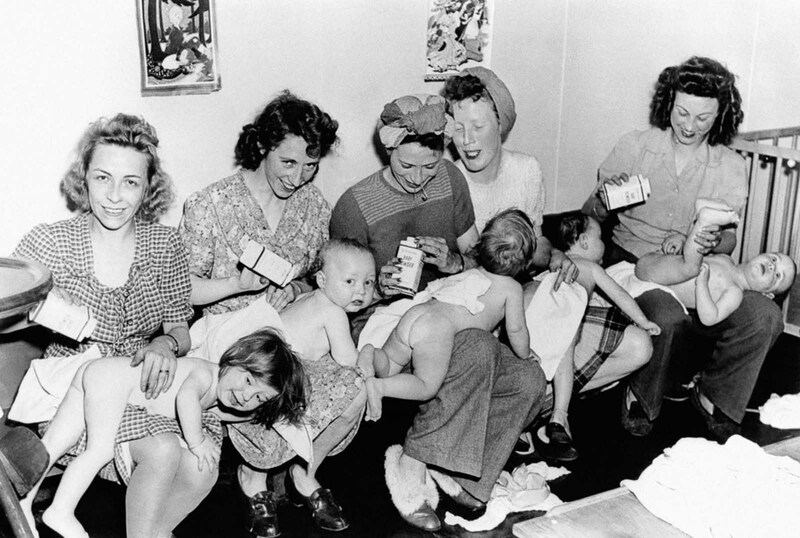 New mothers change their babies’ diapers in New York City, 1946. A nurse cares for one of many infants at St. Ann’s Infant Asylum in Washington, D.C. 1946. 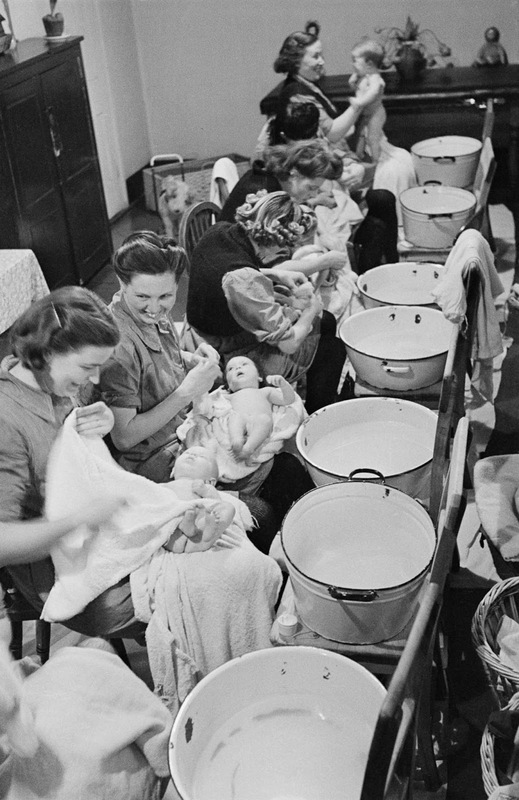 Prisoner mothers bathe their babies in a hospital ward at Holloway Prison in London, 1947. 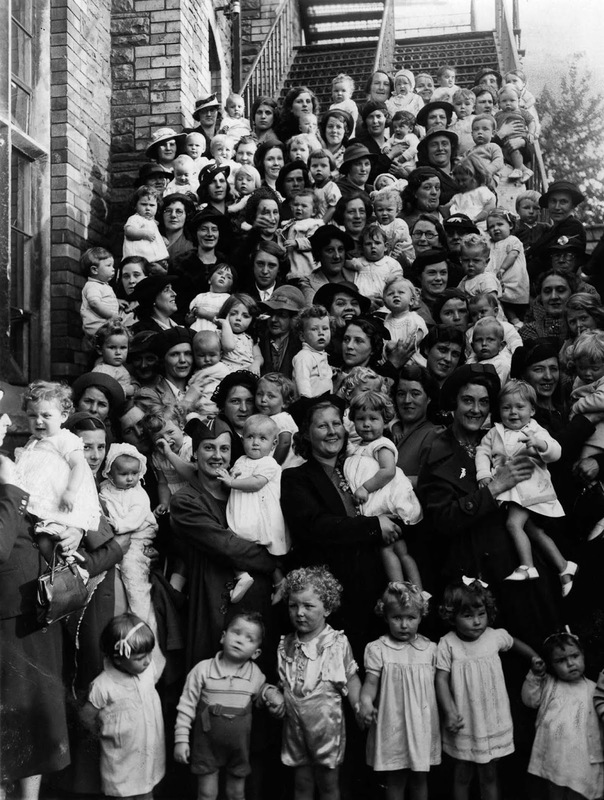 Participants in a baby show in England. 1950. (Photo credit: Hulton Archive/Getty Images).